Good decision to release these JJ, good job welcome back! Looking fab, JJ, as always. Beautiful work. 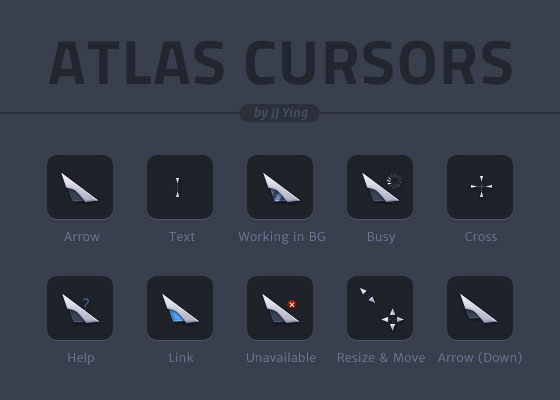 Your cursors are my favorite and most efficient. What has WFX got to do with a cursor, and in my experience, WFX and CFX both work well on 8, and 8.1. Good to see you JJ. Hope to see more!! I know it has not much to do with the cfx but did you also work a bit further on those sparta icons ? If not would you mind if i grab your idea from Sparta control-panel and make some more in 3D i would still refer to you of course? You know I am a fan since quite some time now (since the early days of stardock). Thanks a lot!